Yes, I’m late to the party. With the upcoming release of their shiny new album, Time Stands Still (complete with Mad Max-esque opening video clip), it may be considered an odd thing that I’m going back to their vengeful little gem of an EP, Defy the Skies. It should be remembered at this point that I remain extremely poor. My first priority is my weird little family, and for now we keep ahead of the rent, eating food, and with a decent barter-pile of box wine for Apocalypse World night. Life is good, but it’s for this reason that even dropping $6 AUD on an EP might be a big thing. So anyway, that’s what I’m gonna talk about this week. I have been eating soy, and playing games, but my first week back in customer facing work has left me with precious little time to document it. You know your day is going to go well when it starts with a raven haired warrior woman in full battle armour spurring her dragon mount off a cliff with the rest of its flock close behind spitting flames into the stormy air. I think that this image presents a pretty good metaphorical summary of the Unleash the Archers experience. These furiously talented Canadians approach their epic metal without a hint of irony or compromise, and manage to carry it off beautifully. The vigorous clean vocal of lead singer Brittany Hayes soar on the deathgrowl miasma of her bandmates, her rising screams and clear enunciation vaguely reminiscent of Judas Priest’s Rob Halford. Though it lacks the unified feel of their previous release, the kinda-concept album Demons of the Astro-waste, Defy still manages to take us on a journey in its 15 minute lifespan. Starting slow and building to a driving juggernaut rhythm in The Path Unsought, we hit an energetic crescendo in Upon Ashen Wings that to this reviewers mind marks the EP’s highest point. A short, sharp ending carries us off the end of the recording, Soulstorm giving us our final hours in word and distortion riddled deed. If I had to mark a weakness for this EP, its one that it shares with its predecessor; on occasion, the lyrics feel awkward, a rhyme is strained or a word seems out of place with the mood of the song. But as with all things, the band overcomes this by diving headlong in and challenging anybody to make a bone of it. Its hard to argue with that kind of attitude. And for all that, I feel this performance is an inspired, magnetic creation, and Upon Ashen Wings has taken up a place amongst my favorite songs. With its distinct movements, driving energy and call and response guitar and vocal interlude, this one leaves me longing to headbang despite my sadly shorn state. Unleash the Archers are a fresh and welcome addition to the metal scene. So if you’re in the mood for a brief and furious burst of epic metal, then I urge you to Defy the Skies. This is not quite a review. Its more of a plug, or even a vague mention for something I like. Hell, with their hundreds of thousands of followers I don’t think they really need the help of my tiny blog and its tiny cohort of imaginary readers. 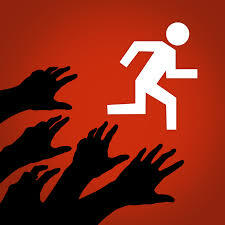 For those of you looking to get into running, the app is called Zombies, Run! It was developed by a company called Six to Start, and is a fantastic combination of radio theater, fitness encouragement and addictive behaviour exploitation. I believe its on both Google Play and the other one. Anyway, this program has been working for me really well, and I mean better than any other futile attempt I’ve made at improving my cardio. The first part of that, I think, is that I love radio theater, and I especially love the revival that its undergone with the fairly recent Renaissance of podcasting. This one is really good; not ostentatious by any means, but you get a group of distinctive characters who tell a really intriguing story from beyond the end of civilization. It moves flawlessly between zombie-chase panic to calmer moments of intrigue and paranoia that unfold between Runners, the scavengers and couriers of a post-apocalyptic settlement. So the story is great. But for me, I think its the acquisition of non-existent resources that gives this little piece of kit its psychological force. Alongside the story it tells, and letting you set your own playlist while you run, the app contains a little mini-game. By having you “collect” odds and ends during your runs, you are able to repair and improve your little hamlet. When imaginary people are relying on you, it can be a strangely effective motivator. A bit like this blog really. Anyway, if you get the chance, I recommend you check it out. Well worth the few dollars it’ll cost you.